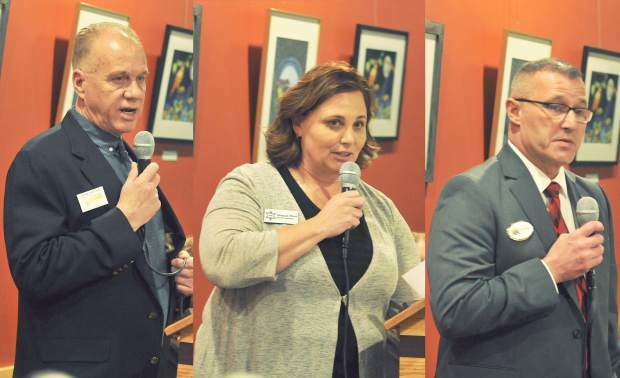 Nevada County candidates for Sheriff 2018, from left, John Foster, Shannan Moon, and Bill Smethers, speak to the Business and Professional Women of Nevada County's candidates night dinner at Summerthyme's Restaurant. It’s been about 20 years since Nevada County had a new sheriff. This year’s election will ensure someone different takes the county’s top law enforcement job, though voters might not know who that person is on June 5. Former Grass Valley Police Chief John Foster, sheriff’s Capt. Shannan Moon and sheriff’s Executive Lt. Bill Smethers are running for sheriff. One of them must get at least 50 percent plus one vote to win outright. 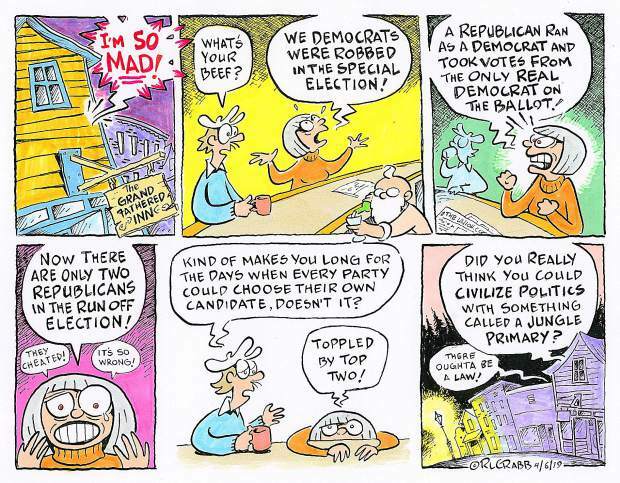 Otherwise the top two vote-getters advance to the November ballot. All three candidates have decades of experience in law enforcement. At forums they’ve argued over that experience, giving reasons why they’re set apart from each other. The campaign hasn’t reached the intensity of the district attorney’s race. Sheriff’s candidates have joked with each other at forums, needling each other but mostly remaining friendly. Once the dust settles, one of these candidates will become the leader over the largest law enforcement organization in the county. Pointing to a 35-year career in law enforcement, Foster said he’s the best candidate for the job. He said that as Grass Valley police chief he encouraged community engagement. He’s built the relationships that enable collaboration, calling himself the outside candidate that will bring a different direction to the Sheriff’s Office. Foster said voters want to see a greater law enforcement presence in their community. He’ll have deputies attend homeowner association meetings. They wouldn’t stay for the entire meeting, but instead give a short talk before leaving. What’s key to Foster is the community interacting with deputies in a non-law enforcement setting. Additionally, Foster said people want deputies to follow up with them about thefts and burglaries. Residents don’t feel they’re receiving a level of service they should from law enforcement. That’s another reason why the Sheriff’s Office must step up efforts to connect with the community, he said. Pivoting to cannabis, Foster said he sees people in three categories of enforcement: those who follow the law, those who want to obey and the people with no intention of being legal. County code enforcement should handle the first two, and law enforcement the last, Foster said. Deputies should focus on criminal cartels who trespass, pollute the environment and scare people, he added. “Send a message that we are actively going to address this issue,” he added. Candidates have fielded questions about marijuana at forums. People also have raised the issue of concealed carry weapons permits. Foster said the existing permit process works well. He said some people may believe he won’t issue those permits, because as police chief he didn’t. As sheriff he will. Focusing on the needs of the Sheriff’s Office, Foster said the department needs a manager who understands hiring, discipline and local ordinances. He said that experience sets him above the other candidates. Born and raised in Nevada County, Moon said she has an uninterrupted 28-year career in law enforcement here. She understands the varied roles of the Sheriff’s Office, from the coroner’s office to patrol. “For 28 years, I’ve provided every service from the ground up,” she said. Moon said she’s supervised deputies as a sergeant, managed officers as a lieutenant and commanded them as a captain. For Moon, the creation of a strategic plan is her first priority if elected. She called the Sheriff’s Office a $35 million business without such a plan. She wants this county safe for those who live, work and visit it. A strategic plan will ensure priorities are set, making the Sheriff’s Office proactive instead of reactive. She also can better address issues like homelessness and mental illness with the plan. Pivoting to homelessness, Moon said the Sheriff’s Office should collaborate more with other agencies like the county’s Behavioral Health Department and Brendan Phillips, the county’s housing resource manager. Moon wants to see people receive treatment in jail. If someone’s incarcerated and has mental illness or drug issues, authorities should ensure they continue to receive services when they’re released. What’s required is a coordination of services, she added. “We could see tremendous change in folks,” Moon said. Discussing funding, Moon said she wants to ensure Sheriff’s Office resources are allocated properly before seeking more money. She pointed to two deputies currently working with the federal Drug Enforcement Administration. Moon wants to keep those deputies in that role, but only if the allocation of office resources meets local needs. Shifting to cannabis, Moon said voters have spoken on the issue. She’d like two deputies currently assigned to civil abatement to instead focus on clearly illegal grows. County code enforcement should handle its own ordinance. “That’s where our sheriff’s resources need to be,” Moon said of illegal grows. Talking about concealed carry weapon permits, Moon said she’s overseen that process since July. She examines the backgrounds and training certificates of applicants before issuing those permits. She said there’s very few problems with the process and intends to change little about it. An executive lieutenant with the Sheriff’s Office, Smethers said he believes crime in this county is worse than when he grew up here. He wants to become sheriff to keep this a safe place to live. Smethers pointed to his 21 years with the Sheriff’s Office and management experience across the department’s divisions as reasons to vote for him. He noted that the Sheriff’s Office has responsibilities some people might not know, like coroner, corrections, court security, animal control and search and rescue. “The experience and knowledge is necessary to step into this position and hit the ground running,” Smethers said. On his first day Smethers wants to focus on his command staff, ensuring a smooth transition. He wants no lapse in services, and wants a new undersheriff and any captain and lieutenant positions filled quickly. Switching to marijuana, Smethers wants the county to handle civil enforcement. The Sheriff’s Office should focus only on criminal aspects of cannabis. Smethers differs from his opponents about marijuana’s status as a Schedule I drug under federal law, where he thinks it should stay. He said marijuana is an easily abused substance. Intoxicated drivers and higher THC levels in cannabis concern him. “As sheriff, I will continue following the state law and the local ordinance,” he said. Addressing concealed carry weapon permits, Smethers said the existing policy works well. He said some people don’t like the waiting period, adding that background checks — a cause of delays — go through the state Department of Justice. Smethers said that school resource officers are the only ones allowed weapons on school campuses. He’d like more officers in schools. They could provide educational programs, talking about bullying in school while providing a presence that keeps campuses safe. Smethers said the Sheriff’s Office has made some recent hires, but more are needed. He’d speak with the Board of Supervisors about funding for more personnel and the addition of a grant writer. Smethers said he’s the best candidate because of his boots-on-the-ground experience, the knowledge of the different divisions he’s managed and the respect deputies have for him. It’s important that his staff is happy, Smethers said. “If they’re happy, they’re going to provide a better service to the community,” he added.